The Bible tells us that God destroyed Sodom and Gomorrah despite Abraham’s intercession, after he was unable to identify even ten righteous people in these cities. Alas, I believe that if one were to review the entire spectrum of Palestinian political, religious and intellectual leadership, one would be unable to identify even a single righteous or moderate Palestinian leader, committed towards achieving a genuine peace. We are repeatedly being told that President Mahmoud Abbas and the Palestinian Authority are our genuine peace partners and that we are unlikely to find more moderate Palestinians with whom to negotiate. refuses to recognize Israel as a Jewish state, insists that the “occupation” dates back to 1948 and even denies any Jewish link with the Holy Land. sanctifies mass murderers of Israeli women and children by bestowing honor on the killers and granting state pensions to their families. rules over an authority in which the controlled media, mosques and state educational system incite hatred against Jews and deny Israel’s right to exist. endorses the execution of any Palestinian who sold land to a Jew. assures his people that any future Palestinian state will be entirely cleansed of Jews. is committed to reuniting with the genocidal Islamic Hamas whose charter calls for the murder of all Jews and the elimination of Israel. Besides refusing to negotiate with Israel, Abbas effectively rejected offers made by former Israeli Prime Minister Ehud Olmert to cede 95% of the territories conquered in response to Jordan’s offensive against Israel. Indeed, the more Israelis concede, the more Abbas demands. Today he has escalated the issue of so-called Arab right of return of refugees to Palestine as a non-negotiable demand, despite realizing that this would bring an end to Jewish sovereignty which no Israeli government could contemplate. Some PA leaders are now becoming less inhibited. Only a few weeks ago, a prominent Fatah leader explicitly proclaimed that a Palestinian State would merely represent the first stepping stone towards the ultimate objective of eliminating the Jewish state. Unfortunately, all opinion polls demonstrate that the Palestinian masses have been brainwashed and endorse these views. Professor Sari Nusseibeh, the president of Al-Quds University, was hailed by many naive Israelis as a Palestinian model of moderation. 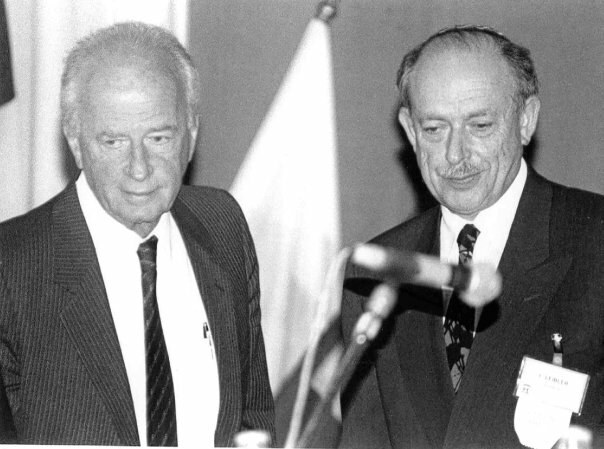 Dr. Yossi Beilin referred to him as a living testimony to the fact that Oslo was not a failure. Nearly 10 years ago I challenged the bona fides of Nusseibeh, pointing out that he was appointed by, reported to, and accepted instructions from Arafat. I observed that political dissidents under Arafat’s authority had extraordinarily limited lifespans and suggested that Nusseibeh’s role was to provide the PA with a moderate face to the Western world. His amiable and soothing approach was obviously designed to revive Israel’s fond memories of the “irreversible peace process” and Arafat’s cynical “peace of the brave”. Whereas Nusseibeh did in fact call for an end to violence and condemned boycotts, he was also recorded in a Palestinian television program expressing sympathy and praising a militant mother of a suicide bomber whom he referred to as “a soldier dying in battle”. He always took care not to pass judgment on suicide bombers, merely questioning the benefits of the strategy rather than its morality. He was often bracketed with Arafat’s Jerusalem representative, the late Faisal Husseini, who was also considered a “moderate” throughout most of his life. Yet following his death, Husseini was quoted in an Egyptian newspaper interview, stating “we must distinguish our strategies and long-term goals from the political phased goals which we are compelled to accept due to international pressures”. The “ultimate goal is the liberation of all historic Palestine… Oslo has to be viewed as a Trojan horse”. In a lengthy article recently published on the Al Jazeera website, Nusseibeh set aside his cloak of moderation and, like Faisal Hussein, demonstrated that despite the sophisticated chatter, he was no more moderate than any of his Palestinian counterparts. His article is a passionate opposition towards recognizing Israel as a Jewish state. The arguments he employs, arguing that Jews should be the only people denied the right to statehood, testify to the fact that his moderation is a sham. He warns that were Israel to be recognized as a Jewish state, it would become an “apartheid” entity. Not only would Israel’s Arabs be stripped of their citizenship and other rights, but they would also be killed like the ancient Canaanites and Jebusites were by the Israelites according to the Bible. He conveniently ignores that Israel as a Jewish state was the rationale for its creation by the United Nations in 1947. He also overlooks the inconsistency that the new Palestinian entity would be governed by sharia law and cleansed of any Jews and that there is no Arab country which remotely extends similar rights to minorities comparable to Israel. Furthermore he has the gall to condemn Jewish intolerance towards other faiths in Jerusalem, disregarding the fact that it was only when Jerusalem came under Jewish sovereignty in 1967, that freedom of religious association and worship were extended for the first time to all religions – in dramatic contrast to the manner in which the Jordanians ruled the city. Adopting the Abbas UN approach, Nusseibeh also reneged on his previous call to Palestinians to cease promoting the right of return for Palestinian refugees to Israel. He actually insisted – hold your breath – that 7 million diaspora Palestinians are entitled to repatriation or compensation. Nusseibeh’s turnaround reaffirms that there is not a single Palestinian leader of political, religious, or intellectual distinction who could be described as a moderate and would be willing to support a negotiated settlement to achieve genuine peace deal with the Jewish state. And in this insane Alice in Wonderland global environment, we are being told to deal with these bigots as though they were genuine peace partners. The reality is that appeasing these hypocrites, far from bringing us closer to peace, merely embolden the radicals who confront us with ever escalating demands which few of the original architects of Oslo – certainly not Yitzhak Rabin – would ever have conceded. To the world and those calling on us to continue providing unilateral concessions – which without exception weakened our position and encouraged our adversaries – I make one challenge: Please identify one single Palestinian leader or intellectual who genuinely advocated moderation and was not assassinated.